The Best In Heritage Conference, held in Dubrovnik, was the first of what is now an annual event celebrating award-winning and outstanding museum and heritage projects. The September 2002 conference, held in the 18th century Marin Drzic Theatre included presentations from English Heritage, The Anne Frank House Amsterdam, Helsinki Theatre Museum, The Science Museum, The National Palace Taipei, Space City Toulouse, and the Gernika Peace Museum. The conference was organised by the Director of the Information Science Department of Zagreb University. 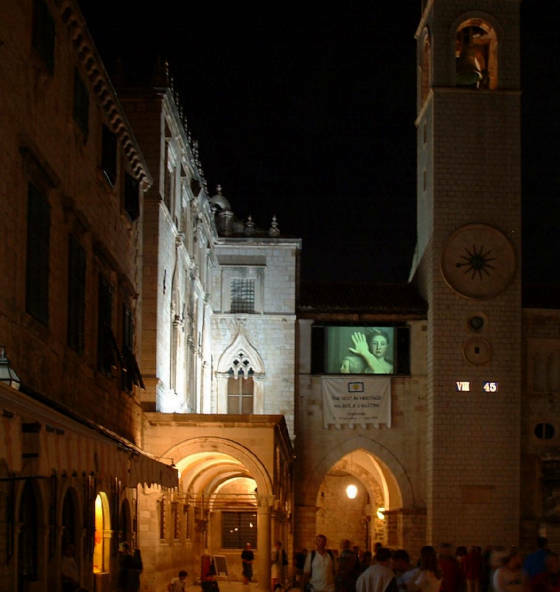 My performance and installation projects were presented at the conference, and the videos Touch and Lies and Belonging were projected onto a balcony of the 16th century Sponza Palace overlooking the main street and square of the Old City.